These springs are hot rolled using alloy spring steel, heat treated, stress relieved, pre-set, enamel painted. Spring rate is 450 lbs. for the front, and 350 lbs. in the rear. Hot rolling produces a spring with a consistent grain structure that is extremely resilient and will not deform or change rate. The combination of hot rolling and using only the highest quality alloy wire results in a spring with superior performance and ride characteristics. For increased strength, the spring perches are machined from hot forged AL6061-T6. 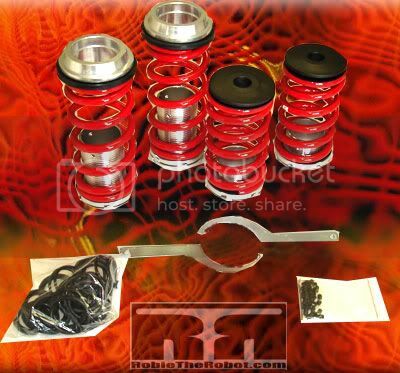 These kits allow you to adjust your ride height anytime you want. The front system allows up to a 3" drop, and the rear allows up to a 4" drop. They provide more suspension travel and therefore will ride better than a normal lowering spring, even at extremely low settings. 1 set of Installation Instructions. Click HERE to view them online! 0 in Stock – Currently on backorder.